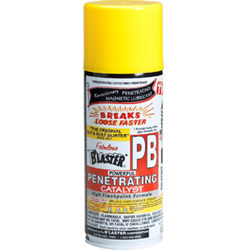 B'laster PB Penetrating Catalyst BOWES CH PB Blaster. The world famous PB Blaster Penetrating Catalyst is more than just great. PB quickly breaks loose surface tension rust and corrosion by creeping up, around and in to hard-to-reach cavities. It's ideal for brake, exhaust and suspension system jobs. Plus, lubricating film remains on parts to help prevent further rusting.